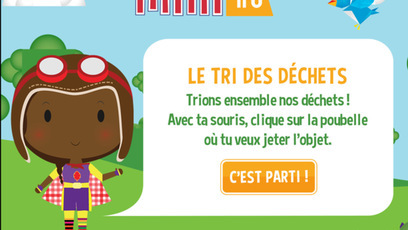 Écolo fille is also available on Mini TFO A section just for the kids, without ads! Click to explore! 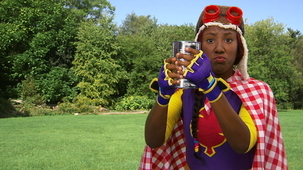 With her sidekicks, Écolo-Fille, protector of the environment, constantly works at thwarting the negative and destructive plans of her enemy Malevelle. She manages to do so with her super-éco and her buddies Compost, Recycling and Garbage. Malvelle doesn´t always pay attention. 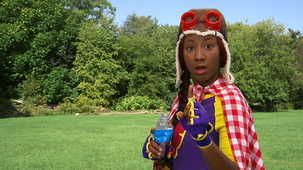 Écolo-Fille gives him some tips on how to behave, how not to waste, and how to be kind to the environment. This time, Malvelle is eating a messy unhealthy snack with his fingers. Thankfully, Écolo-Fille is there to set him straight! MALVELLE la sorcière est assise sur un comptoir de cuisine. Elle verse du sirop de chocolat et des vers en jujube dans un bol. Puis, elle en mange beaucoup et s'effondre de fatigue sur le comptoir de la cuisine. ÉCOLO-FILLE avec son costume de super héroïne la rejoint. As-tu vu ça, mon super-éco? Ah, là là, là là! une collation pas très santé. Ah, oui! J'ai une idée. ÉCOLO-FILLE nettoie les mains de MALVELLE qui sont pleines de sirop de chocolat. ÉCOLO-FILLE nettoie le comptoir avec du vinaigre tandis que MALVELLE dort toujours. Elle retire les bonbons et lui donne une pomme et une banane. ÉCOLO-FILLE quitte la pièce. MALVELLE se réveille, cherche ses jujubes, puis, elle se résout à manger la banane. Malvelle doesn´t always pay attention. 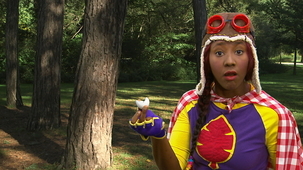 Écolo-Fille gives him some tips on how to behave, how not to waste, and how to be kind to the environment. Malvelle is drawing, but is wasting a lot of paper! Fortunately, Écolo-Fille knows how to reuse it. Écolo-Fille`s mission is to sort the litter that her enemy Malevelle throws in nature. She prevails, with help from her super-eco and her sidekicks Composte, Recyclage and Poubelle. Today, Écolo-Fille finds some old shoes. Écolo-Fille`s mission is to sort the litter that her enemy Malevelle throws in nature. She prevails, with help from her super-eco and her sidekicks Composte, Recyclage and Poubelle. Today, Écolo-Fille finds a plate. Écolo-Fille`s mission is to sort the litter that her enemy Malevelle throws in nature. She prevails, with help from her super-eco and her sidekicks Composte, Recyclage and Poubelle. 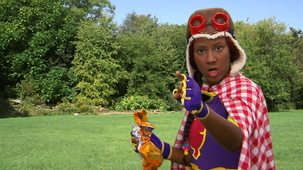 Today, Écolo-Fille finds a bag of potato chips. Écolo-Fille`s mission is to sort the litter that her enemy Malevelle throws in nature. She prevails, with help from her super-eco and her sidekicks Composte, Recyclage and Poubelle. 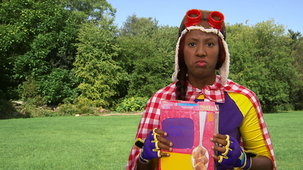 Today, Écolo-Fille finds a cereal box. Écolo-Fille`s mission is to sort the litter that her enemy Malevelle throws in nature. She prevails, with help from her super-eco and her sidekicks Composte, Recyclage and Poubelle. Today, Écolo-Fille finds a tin can. Écolo-Fille`s mission is to sort the litter that her enemy Malevelle throws in nature. She prevails, with help from her super-eco and her sidekicks Composte, Recyclage and Poubelle. Today, Écolo-Fille finds a plastic bottle. Écolo-Fille is hot in pursuit of Malevelle. She`s on a mission to catch her enemy and sort the garbage that she leaves behind, with the help of her sidekicks Composte, Recyclage and Poubelle. Today, Écolo-Fille finds a tissue. Écolo-Fille is hot in pursuit of Malevelle. She`s on a mission to catch her enemy and sort the garbage that she leaves behind, with the help of her sidekicks Composte, Recyclage and Poubelle. Today, Écolo-Fille finds an egg shell. Écolo-Fille is hot in pursuit of Malevelle. She`s on a mission to catch her enemy and sort the garbage that she leaves behind, with the help of her sidekicks Composte, Recyclage and Poubelle. Today, Écolo-Fille finds an apple core. Écolo-Fille`s mission is to sort the litter that her enemy Malevelle throws in nature. She prevails, with help from her super-eco and her sidekicks Composte, Recyclage and Poubelle. Today, Écolo-Fille finds a banana peel.